Düsseldorf, Germany, 16.08.2016 – BIXOLON Europe GmbH today announces the launch of seven new products to its award winning portfolio of POS, Label and Mobile printing solutions for the European market. 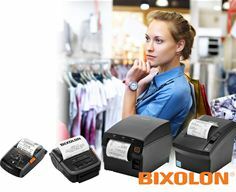 Continuing to innovate, BIXOLON introduces the latest generation of its SPP-R200III 2” (58mm) and the new sleek and lightweight SPP-R310 3” (80mm) mobile receipt & label printers with Bluetooth, Wi-Fi, USB and Serial connectivity options. Now with Easy Bluetooth Pairing via an embedded NFC tag and supporting Android™, iOS ™ and Windows® smart devices, alongside Apple MFi iAP2 certification. Launching the latest in label printing innovation, the new SLP-TX220, 2” (58mm) industry leading Thermal Transfer Label Printer. Featuring built-in Bluetooth, featuring Apple MFi iAP2 certification, enabling simple, consistent printing from tablets, smartphones and other smart devices. Updating its successful POS printer range, BIXOLON showcases the improved water resistant, front exit SRP-F310II 2” (58mm) and 3” (80mm) thermal receipt printer with IP12 certification, now featuring print speeds up to 350mm/sec. The updated SRP-275III ergonomic dot matrix kitchen printer offers Intelligent Logic Seeking and Bi-Directional Print Technology with Ethernet connectivity offered as standard. Alongside the new improved budget SRP-330II 3” (80mm) thermal receipt printer, complete with double or triple interface options. Delivering innovative solutions to the fast paced mPOS market, BIXOLON’s new B-gate mPOS hub solution provides the previously missing link between smart devices and wired POS peripherals. Connecting tablets or smart devices to wired POS peripherals via an intelligent Bluetooth or Wi-Fi interface. B-gate simply removes the complex issues of separately pairing expensive wireless peripherals such as scanners, case drawers, customer displays and more.